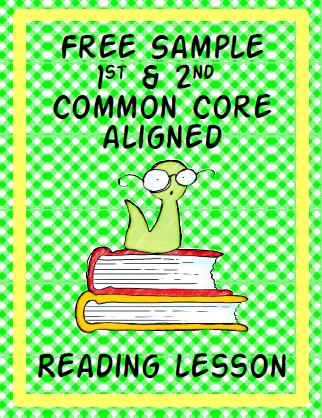 This is my first series of packets that I have aligned with the Common Core Standards. Hopefully, with the C.C. standards being listed, it will save you time to work on other things that are on your “to do” list. This time of year, it seems like the “to do” list gets longer and longer. Each packet has 5 reading sheets that each have 5 sentences. Students will read the sentences the first time at school. At the bottom of the sheet is a rating scale. Teachers will rate the students’ fluency the first time. 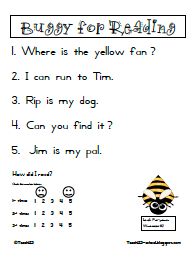 Then students take home the reading sheet for homework. Students will read the sentences twice for their parents. Parents will rate their child’s fluency the next two times. 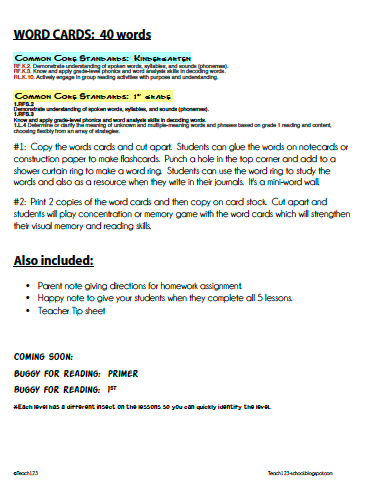 A parent note explaining the homework is included. 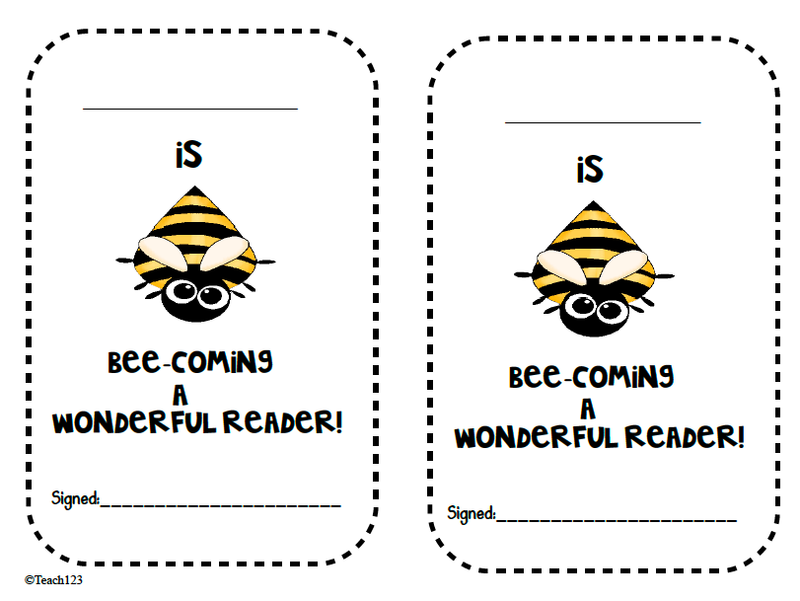 Plus, there is a happy note to give your students when they complete all 5 reading sheets. This is a great documentation tool! Also included are 5 writing activities that can be used as a literacy center, handwriting assignment, or homework. Students will trace and then copy the 5 sentences they read on the reading sheet and write their own sentence, plus illustrate it. There are 40 word cards in the Pre-Primer packet and 52 word cards in the Primer packet included as well. These may be copied and glued on construction paper or notecards. Punch a hole at the top and put on a shower curtain ring. 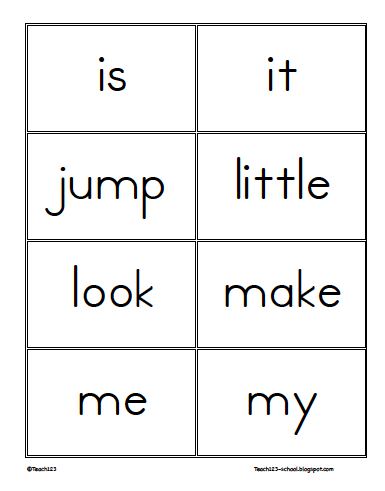 Students will have their own mini-word wall that is also manipulative. Perfect for your tactile-kinesthetic learners. You may also make 2 copies of the word cards on card stock, cut apart to make a memory game. Perfect literacy center to strengthen visual memory and sight word knowledge. It’s a fun and easy way to add a little color to your lessons! Another tip is using a secret-decoder. You tape 2 notecards together, but leave a space between them. You use 2 pieces of tape, one on the front and another on the back. The 2 pieces of tape stick together to make a clear strip. Students cover their words with the notecards and read the words that are in the clear strip. This helps those young readers who have trouble with directionality. It also helps dyslexic students, too. To add a little color, copy on neon card stock. 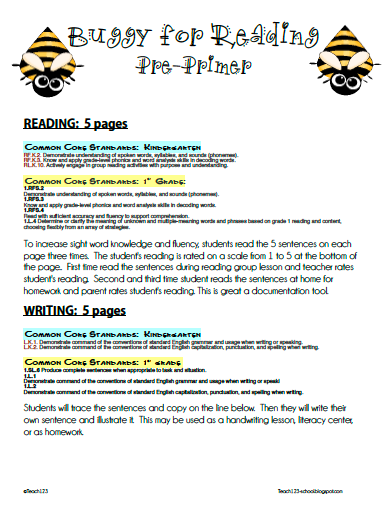 The overview sheet lists the Common Core standards for each activity. The kindergarten C.C. standards are highlighted in blue. The 1st grade C.C. standards are highlighted in yellow. This is a happy note you can give your students when they complete all the assignments. This is from the Pre-Primer packet. This packet is on the Pre-Primer level. Each level will have a different insect as its mascot so you can easily tell the level of the assignments. This packet is on the Primer level. There is a book #1 and book #2. Click on the picture to visit my store. *Download the preview for Primer Book #2 at TPT to get a free sample. Love it! 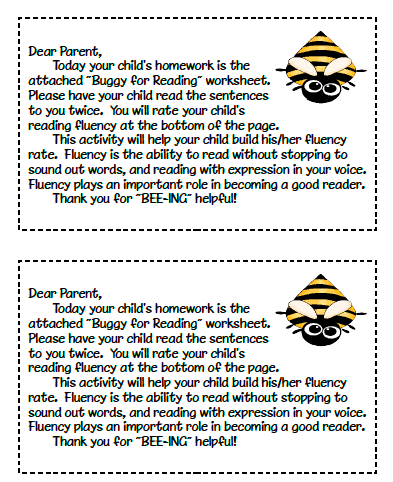 I've been emphasizing fluency with my kinder kiddos, and this is fabulous! Great job! I found your blog through the linky:)! I'm your newest follower:) I'm having a giveaway over at my blog … Hope you'll stop by and help me reach 100 followers! !